CHAMPAIGN, Ill. — Fuels that are produced from nonpetroleum-based biological sources may become greener and more affordable, thanks to research performed at the University of Illinois' Prairie Research Institute that examines the use of a processing catalyst made from palladium metal and bacteria. Biofuels are made from renewable materials such as plants or algae, and offer an alternative to petroleum-based sources. However, many biofuels are costly to produce because the precursor product, bio-oil, must be processed before it is sent to the refinery to be turned into liquid fuel. Illinois Sustainability Technology Center researcher B.K. Sharma and his co-authors have identified and tested a new processing method. "Bio-oil forms from the same chemical reaction that forms petroleum," Sharma said. "But what takes millions of years naturally in the ground takes only minutes in the lab using a process that is very similar to pressure cooking." Published in the journal Fuel, their findings point to a cheaper, more environmentally friendly and renewable catalyst for processing that uses common bacteria and the metal palladium, which can be recovered from waste sources such as discarded electronics, catalytic converters, street sweeper dust and processed sewage. The bio-oil produced in the lab from algae contains impurities like nitrogen and oxygen, but treating it with palladium as a catalyst during processing helps remove those impurities to meet clean-air requirements, Sharma said. For the palladium to do its job, the bio-oil needs to flow past it during processing. Previous studies have shown that allowing the oil flow through porous carbon particles infused with palladium is an effective method, but those carbon particles are not cheap, Sharma said. "Instead of using commercially produced carbon particles, we can use bacteria cell masses as a sort of biologic scaffolding for the palladium to hold on to," Sharma said. "The oil can flow through the palladium-decorated bacteria masses as it does through the carbon particles." To test the effectiveness of the new method, Sharma and his co-authors performed a variety of chemical and physical analyses to determine if their new processing treatment produced a liquid fuel that is comparable in quality to one made using the commercially produced catalyst. "We found our product to be as good or even slightly better," Sharma said. "We were able to remove the oxygen and nitrogen impurities at a comparable rate, and yielded the same volume of product using our cheaper, greener catalyst as is observed using the more expensive commercial catalyst." 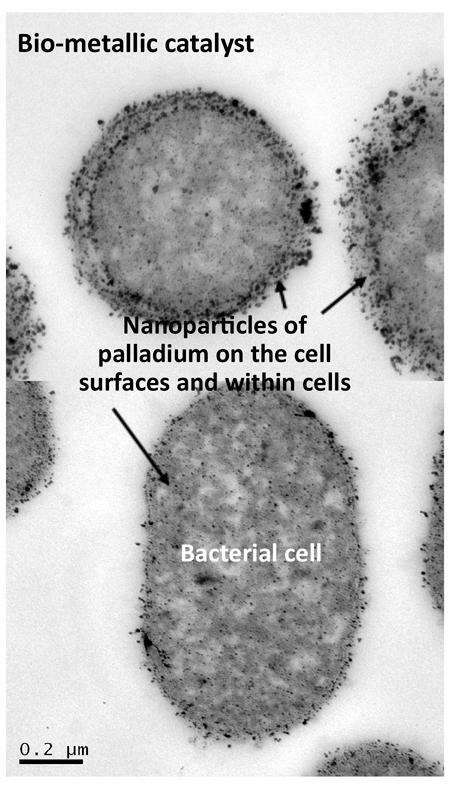 The more costly commercial catalyst has the added benefit that it can be used over and over without extensive processing, whereas the Sharma group's palladium-on-bacteria catalyst will need to undergo processing to be reused. "It is a minor caveat," Sharma said. "The fact that we have shown the potential of making refinery-ready crude oil from algae bio-oil using a catalyst that can be prepared from low-grade recycled metals and green and economical bacterial biomass proves that this is a very promising advancement. In addition, this bio-catalyst would work equally well in petrochemical processing." The work was conducted in collaboration with professors Joe Wood and Lynne Macaskie from the University of Birmingham, funded through the Birmingham-Illinois Partnership for Discovery, Engagement and Education program. The Natural Environment Research Council, UK also supported this research.